Padre, aka Cayenne Padre, is a red male, who was born in 2002, and just celebrated his 5th birthday on May 14, 2007. 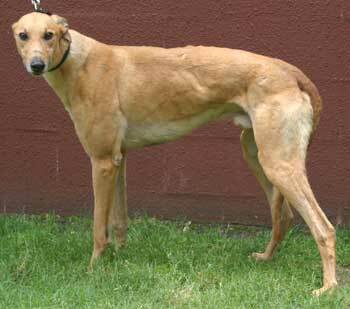 He came to GALT from Valley Race Park in Harlingen on April 8th after he finishing his 172nd race on March 25, 2007. Padre's dam is Fairytale Magic and his sire is Nebraska Rebel. Padre's first race was May 25, 2004, at Multnomah in Oregon, moving on to Corpus Christi, TX and then finishing at Valley Race Park. 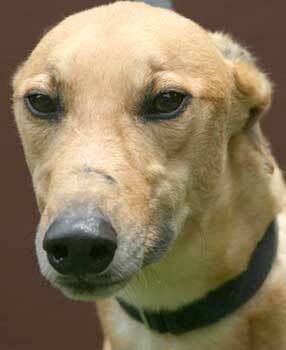 Padre is now looking forward to finding a loving home to relax in and call his own. Padre passed his cat test. He went from zero interest when I showed him Domino walking across the floor, to finally getting in some good sniffs on the new creature encountered. Dom finally got tired of the nosiness and swatted him off. From there Padre didn't want to have anything to do with felines. He did get to hear another cat meow and saw him yawn and stretch. Padre tilted his head for the new sound, but showed no interest otherwise. 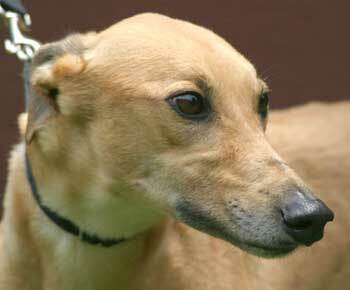 But as with any new Greyhound, he will need to be trained and supervised. The next step is to introduce Padre to small dogs. Padre is doing just fine. He is still in "cat-training"—he is usually fine but several times a week he still tries to run after the cats or makes noises at them and whimpers, but I think with training he will be cat tolerant. I still have to watch him closely and use the muzzle periodically if he starts the noises and has increased interest in the cats. His attention is broken very easily from them, so I feel eventually he will be okay. He's learning to tolerate his crate, but it is really not his favorite place. However, he stays in there during the day just fine. He's a sweetie and a really laid-back dog. He is completely fine with Jacob (the toddler) and is the most laid-back foster yet as far as being around him (even better than my own). I still watch them very closely, but he does not get nervous at all when Jacob is around. I think he'll be really good with kids. Padre is now considered cat tolerant inside our house. He shows no interest in the cats other than an occasional sniff hello. The one chance he had to see our tabby outside, his ears perked up and tail wagged like he was interested, -- but that's in an outdoor environment. Because he is good with our cats, he now has full run of the house when we get home. He usually sleeps in our bedroom either on the dog bed or in his crate. He is crated during the day when we're at work for about 8 hours. He still really does not like going into his crate and has to be convinced to go in, but he does fine in there all day. He is completely potty-trained and has never had an accident in our house. Padre gets really excited when it's time to go on a walk - his favorite activity. He happily just walks closely by my side and is excellent on a leash. He's an enjoyable walking companion. Padre enjoys playing with stuffed squeaky toys or chewing on a Nylabone when he gets frisky. Otherwise, he loves to be petted or scratched in the right spot, then keeps us company wherever we go. He is good in the car and now has figured out how to jump up into the back of our SUV by himself. He is still good with our toddler and is more vigilant at watching out for flying toys or books that may come his direction but he just gets up and moves elsewhere if he has had enough. He's a sweet, gorgeous boy that is enjoying his foster life but is excited about going to his forever home.